The complete July 4, 1863, issue of the Los Angeles Star is available from USC, which scanned a copy at the Huntington. Note: This is an encore post from 2013. July 4, 1863: Los Angeles plans to celebrate the Fourth of July with a 34-gun salute and a fireworks display in the evening. A ball was planned at the Willow Grove House in the afternoon and another ball in town in the evening. That young Henry Rasche, who ran a music store on Montgomery Street in San Francisco, seemed to be such a nice man. It turns out he is an accomplished burglar. 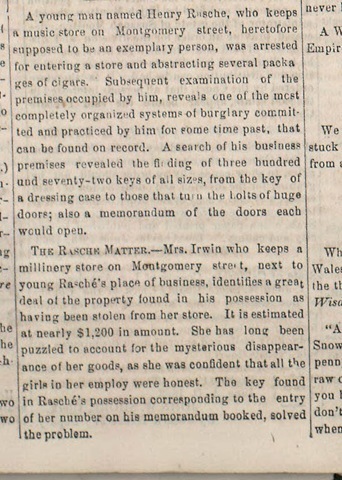 “A search of his business premises revealed the finding of 372 keys of all sizes, from the key to a dressing case to those that turn the bolts of huge doors; also a memorandum of the doors each would open,” the Star says. Mrs. Irwin, who owns the adjoining millinery shop, says that much of the property in his possession was stolen from her store. This entry was posted in 1863, Crime and Courts, San Francisco and tagged #Crime, #Fourth of July, 1863, San Francisco. Bookmark the permalink.